Bladder leakage doesn’t have to be embarrassing. In fact more More people with bladder leakage are in their 20’s than their 80’s. After having five children I have experienced incontinence myself and I am only 37. Sometimes it happens when I sneeze, laugh or while exercising. I understand that this is perfectly normal and I am okay with it. I first found out that I had bladder leakage after my fourth child was born. I was working out trying to lose the baby weight, but I just couldn’t control my bladder. That was when I began using incontinence products. Back then the products for bladder leakage were so uncomfortable. I now use new Depend Silhouette Active Fit briefs for women. Depend underwear is not just for old people. I am not afraid to use Depend now that they have an all new thin and comfortable design. Over 51 million American women experience bladder leakage. That’s 1 in 3 American women! In support of the millions of women who may need a different kind of underwear, the Depend brand is introducing Depend Silhouette Active Fit briefs, a new moderate-absorbency brief featuring a thin design for complete comfort and the trusted protection of Depend brand. Depend Silhouette Active Fit briefs have a lower rise+ for an underwear-like look, fit and feel.. As a category first, the product is available in black and beige colors. 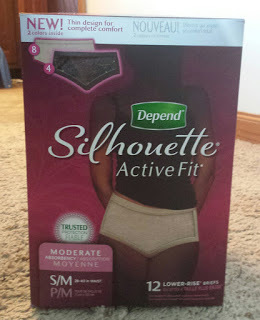 *Today’s post is sponsored by Depend, but my love for their Silhouette Active Fit Brief is all my own!